Important centuries-old traditions and the majestic historical heritage of Catania. On this excursion we will explore two sides of Sicily: its famous food products, which we will of course sample, and its equally famous historical remains, from Magna Graecia to the modern age. On leaving the port, we will set off for the slopes of Mount Etna, home to the beautiful Tenuta del Gelso, a marvellous 65-hectares wine estate owned by an ancient and noble Sicilian family, devoted to growing citrus fruits, vines and olives. The Tenuta del Gelso became famous in the early 19th century thanks to the entrepreneurship of Baron Franz Mannino, who founded a flourishing trade in citrus fruits and wine produced on the estate. Experiencing varying fortunes over the years, the family still holds the reins of the estate, which now boasts an excellent international reputation for the quality of its products. During our visit we will admire the citrus grove, home to a number of varieties, from classic Sicilian blood oranges to more exotic miyagawa oranges, several of the rooms in the country house, and the area's most well-known wine cellar, a place dedicated to the pressing of grapes and a symbol of the family's ancient tradition of wine-making. We will have the opportunity to sample a delicious tasting of typical products from the estate, the perfect end to this journey into the best Sicily has to offer. 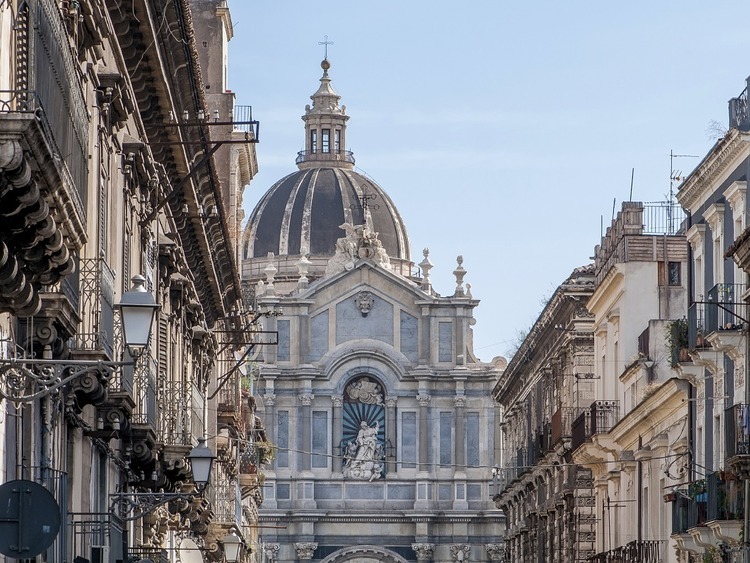 After visiting the estate, we will continue on to Catania, a stunning Baroque city at the centre of a vast plain between the Ionian Sea and the imposing figure of Mount Etna, Europe's largest volcano. From our comfortable coach, we will admire some of the city's most picturesque and characteristic sights. We will travel along the central Via Etnea, lined with splendid churches and imposing Sicilian Baroque palaces, and pass through Piazza Stesicoro , home to the 19th century monument dedicated to the Catanese composer, Vincenzo Bellini, a virtuoso work by Giulio Monteverde. We will then have the chance to admire the ruins of the Roman amphitheatre, of which the arena and lower order of arches are still visible, just enough to evoke the grandeur of this entertainment venue that was only slightly smaller than the Colosseum. A brief stop in the historic centre allows us to visit the Cathedral of Saint Agatha, home to the remains of the saint, and Piazza Università, before we spend some free time in the busiest part of the city. The excursion involves some walking.